It has been a very busy few weeks here at the studio. I have been finishing up client projects and new ones are waiting on the worktable. My customers are a very eclectic group, bringing me all kinds of challenges. I love it. They range from the wedding party alterations, to draperies for a whole house, to doll bedding and clothing, to Star Wars attire for conventions. Add to that my own Simply Rebecca products, and I can be quite a busy gal. Though it can get chaotic at times, I love the variety. It never gets mundane and many times challenges me to step beyond my comfort zone. I truly love my job. I want to chat a little today on an story I just read. It touched my spirit. We all talk about where the world is going, the fear, the hunger, the disasters, the losses. Some of what we see and hear tears the heart right out of your chest. Most of us feel a stirring inside of wanting to do something to make it better, but have no idea how. It is so overwhelming. What can we possibly do to make a difference? I know because I have said those same words. I was always active in my community, joining women's organizations, raising monies to go help in some way. It gave me a feeling of belonging to those around me. But, over the years life took me away from that a bit. Helping others is incredibly soul healing. It fills you with energy you never thought you had. Well Jessica Mindich feels the same way. But, she has taken it one step further. "I grew up in a family that embodied the spirit that you had a responsibility to repair the world. And so I jumped, I walked, I ran to every 5K, everything, and that was how we grew up. And Jewelry for a Cause is an extension of that." Jewelry for a Cause creates jewelry for fundraising tools for not-for-profit organizations. She started the company five years ago out of her home in Connecticut, because she saw communities doing the same old fundraisers and people getting bored with them. We have all been there. How many magazines can we buy and how many chocolate bars can we eat, and how many candles can we burn. She creates beautiful jewelry for different causes, with a portion of the proceeds going to charities around the world to help promote awareness for issues such as breast cancer, Alzheimer's, and drinking water. "There isn't anything that we do that doesn't give back to a cause," Mindich says of her creations. "People were excited to wear what they believe, what they support on them. And these were inexpensive, they were eye-popping, and they had meaning behind them." Jewelry for a Cause also works with artisans from all over the world helping them to create sustainable lives for their families through their craft. Her latest project is incredibly inspiring. She is turning violence into beauty. It took her to the streets of Newark, New Jersey. Made from illegal guns and shell casings found at crime scenes, the Caliber Collection features 'bracelets that sparkle with hope'. While meeting with Mayor Cory Booker the idea came to her. She stood there looking at boxes of empty shell casings, realizing that those were bullets that had been fired in anger. The table piled with guns used in crimes were meant to do harm. They didn't want the bracelets to carry images of anger, just a simple piece of jewelry that was a symbol. The result is a series of pieces that "embody the gun’s transformation from a destructive weapon to a powerful symbol of renewal". 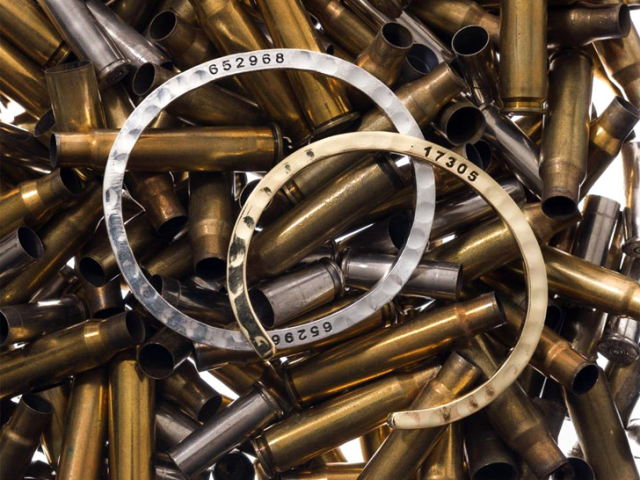 They are pounded gold and silver hoop bracelets with serial numbers from the weapons. The sale of each bracelet is to help the Newark Police Department fund a gun buyback program. The mayor says, "I want them to go to the most profound purpose, which is peace. I wanted them to go to something that would help to reduce violence. Something that would help inspire peace and security." Mindich says, "It's my dream, my absolute dream to bring Caliber to cities across America. My desire that those cities are cities with the highest homicide rates because that's where you're going to have the highest number of illegal guns and make the biggest impact. I don't need chic bracelets from fancy cities. I want the bracelets inside to read cities like Flint, Michigan, and Oakland and New Orleans and places where guns are destroying their communities and as a result they can't rebuild their economy. That would be incredible." Reading this article brought goose bumps to my skin. It fueled the flame inside me. We all have talents that we can turn into something meaningful, something with purpose, something that will make a difference. No more sitting back talking about what is wrong. It doesn't matter how small the project is, or how much money it raises. Every little bit becomes a piece of a bigger picture. With each piece the puzzle become more complete. It is time to physically do something. Otherwise our words only become part of the breeze blowing past us. I applaud Jessica and those like her. It is time more of us create a caring society as we wish it would be, one neighborhood at a time. I know I will. Please take some time to visit Jessica's website and read the many articles written about her and her business. I hope that it will inspire you.